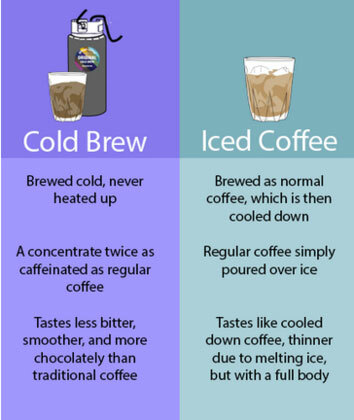 The one major difference between cold brew and iced coffee is the temperature of the water you are brewing your coffee with. Iced Coffee is made like any regular hot coffee brew method. It is simply hot coffee that has been cooled down and poured over ice. Cold brew coffee is brewed with room temperature water instead of hot water. Since iced coffee is brewed hot, you’re changing the composition of the coffee grounds quickly. The heat involved with hot brewing will expedite the oxidation process, which leads to acid degradation and poor taste. Cold Brew is created by steeping medium-to-coarse ground coffee in room temperature water for an extended period of time and then filtering out the grounds. DRIP steeps its cold brew coffee for a minimum of 20-24 hours. Unlike regular coffee, cold brew is never exposed to heat. Cold brew uses time, rather than heat to extract the coffee’s natural sugars, oils, and caffeine. DRIP’s cold brew is produced using a bean-intensive process, which creates a concentrate far stronger, more flavorful, slightly sweeter and much lower acidity levels than regular coffee. The flavor profile is much more complex. DRIP’s cold brew has about twice the caffeine per ounce as a regular cup of coffee. It really packs a punch!! Should one survive the wait, they’ll enjoy a sweet, syrupy cup that sidesteps coffee’s normal acidity and goes down smooth. Minimizing the coffee’s exposure to oxygen is a must, and can be achieved simply by using a container that holds only the desired volume of coffee and water and no more. For extra security, the entire apparatus can be stored in an anaerobic environment. Then we serve it on a nitro tap! The nitrogen affects two main things in the coffee: taste and texture. 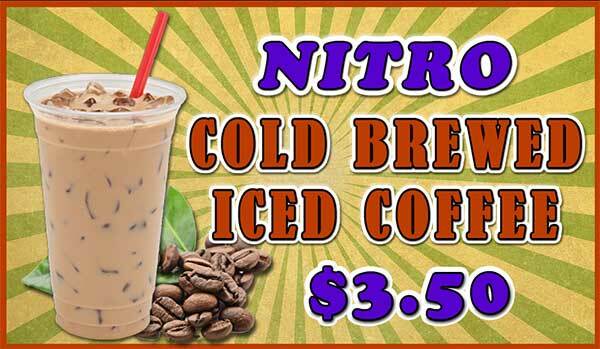 Compared to regular cold brew, nitro coffee is crisper and slightly sweeter…it’s also creamier, even when served black. Which means it’s not uncommon for some coffee drinkers — who usually swear by adding milk and sugar — to drink this stuff straight. 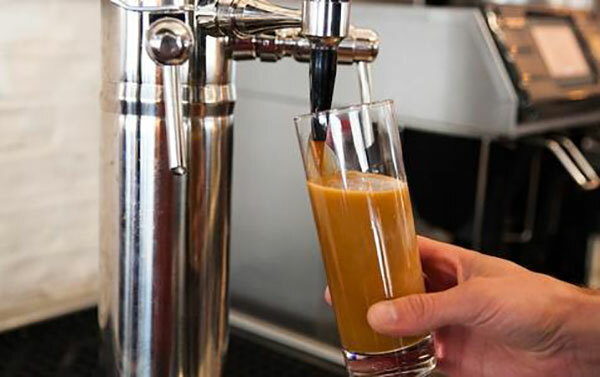 At DRIP, our cold brew is stored in a keg, pressurized, and poured from a tap. The result is a foam finish, and those little champagne-like bubbles rising to the top. It is also much stronger!